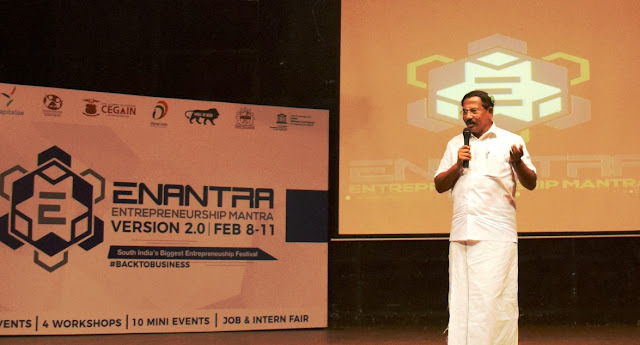 Enantra is South India's Biggest Entrepreneurship Festival and it's hosted by the Centre for Entrepreneurship Development, Anna University along with it's student body, Capitalize. It's also supported and sponsored by the Entrepreneurship Development and Innovation Institute, Government of Tamil Nadu. Enantra- The Biggest Entrepreneurship fest in the city began with an enthralling note on the February 10th 2018 at the Tag auditorium in Anna Univeristy. The esteemed guests invited were Shri. Dharmendra Pratap Yadav Secretary, MSME Department, Govt. TN Shri. Dr. Rajendrsa Kumar, IAS Principal Secretary, CII, Tamil Nadu along with Mrs. Sajeevna Additional Director Entrepreneurship Development and Innovation Institute- Tamil Nadu. PeriFerry is a social inclusion start-up working for the upliftment of the transgender community, aimed to create truly diverse and inclusive workplaces fuelled with empathy and emotional intelligence. A different perspective to education was coined by the LMES academy. The founder made learning simple and effective by presenting interesting Science/Engineering concepts through practical applications in Tamil language. A team of 3 enthusiastic students who set forth an innovation named Dronix aimed to serve various purposes using a fleet of drones. MADIEE creates a holistic learning experience in higher education institutions by unleashing the 'teacher' in today's young working professionals. These speakers helped in throwing light to many unaddressed issues in the society through their Start-Up’s which make a difference in our community. The innaugral function was preceded by a 6 Degree Talk by Mr. Ma Foi K. Pandiarajan Minister for Tamil Official Language and Tamil Culture (Government of Tamil Nadu). The talk highlighted his journey from a student to an entrepreneur. Ma Foi K. Pandiarajan was a very engaging speaker who helped every student in the function travel with his story. Beginning his journey in a small town of Sivakasi till becoming the founder of a well established HR consultancy he has gone through a lot, and his growth has been phenomenal over the years. His talk was very interactive and helped in engaging many students and instigating the thought of becoming an entrepreneur. He shared some intricate details about succeeding in today’s world as an entrepreneur and some ideals he incorporated in his entrepreneurial venture which helped him succeed. As well briefed about the current governmental schemes introduced to encourage Start-Ups around the city. After the session there was small Question and answer session among the audience which made the session interactive. Shortly after the event there was a press coverage where reporters raised several questions based on his talk. Overall the inauguration was a grand success with eminent guests and speakers who graced the occasion as well as the students who enthusiastically came over to attend the event.